Usually pigs are comfortable with human contact, but pigs with little or no experience of humans can be afraid of them. When driving pigs it is important for the group of pigs to remain in continuous movement. Distractions that impede movement include: people moving about ahead of the animals; shadows and high contrasts; shiny reflections; air blowing at approaching animals; noise. The driving distance should be kept short, to allow for the less physically fit slaughter pig of today. Driving tools are used as a handling aid to keep the pigs moving. Driving tools may be designed on various principles, such as shielding pigs from distractions (driving board), using sound ("rattle sticks"), and painful stimuli (electric prods). 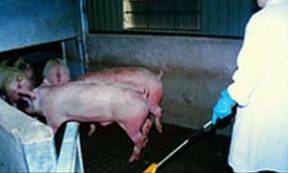 The use of electric prods is banned in many countries; they induce stress and should not be used in the pre-slaughter handling of pigs at all. At this abattoir rattle sticks are used as driving tools. In combination with solid walls and small group size, this method results in appropriate animal flow. Photo: Temple Grandin. Lining up pigs for stunning is a stressful area in pre-slaughter handling, and problems increase with higher slaughter speed. Giving pigs time to explore their surroundings will keep them calm. New group handling systems based on biological principles have shown that high throughputs are possible, but any welfare-friendly driving system can easily be destroyed by high driving speed. This video clearly shows the problem of trying to drive a large group of pigs. The operator cannot influence the behaviour of the leading pig. Video: Sophie Atkinson.